Today started out rainy and cold. It felt like a good day for soup, and I had two soup projects waiting for just such a day! First I made a batch of that escarole soup, using a head of escarole from the farm. Saute a package of sweet Italian sausages with minced garlic (2-4 cloves), then add 2 pints of stock and the escarole. Let that simmer for about 10 minutes or so and add a can of cannellini beans. Flavor the broth with parmesan cheese and serve with good bread. That was lunch. For three of us. The 9 year old asked for homemade chicken noodle soup instead. I just happened to have a quart in the freezer so I heated that up as well. After lunch, I made a triple batch of Icelandic Lamb Soup using up a lot of farm share vegetables: all the turnips, 4 potatoes, 3 leeks and a head of cabbage. After removing the bones and returning the lamb to the pot, it's sitting overnight in the fridge. Tomorrow I'll skim off the fat and can some and the rest will be dinner. Very tall pie. I also made a strawberry jam tart. 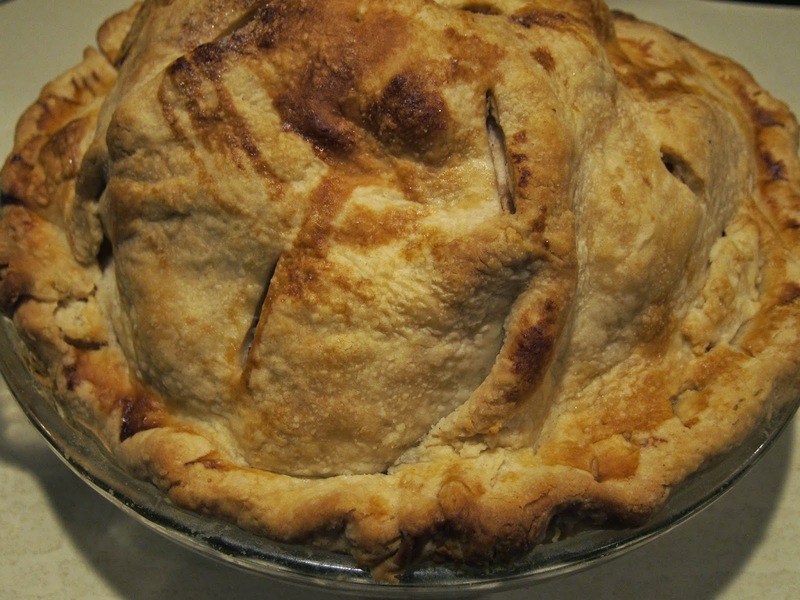 Lastly, I made an apple pie, finally, with some of the apples from when we went picking a few weeks ago. The apples must have been much larger than usual because although I used the same number of apples (9) the pie is so tremendously tall. It looks like one of the pies we used to get a restaurant called Gregg's in Rhode Island - they were at least a foot tall! There's more to do: I need to make a batch of chicken stock, and can the juice I made the other day (some of which went into this morning's smoothies, which were wild blueberries +/- banana, homemade yogurt, local honey, and foraged mixed juice (grape, autumn olive, elderberry, crabapple)). And, someday, I'll do tomato sauce again. I have 5.5 gallons of tomatoes taking up space in my freezer.